The nineteenth-century countercultures that came to define the bohemian lifestyle spanned both sides of the Atlantic, ranging from Walt Whitman to Josephine Baker, and from Gertrude Stein to Thelonius Monk. 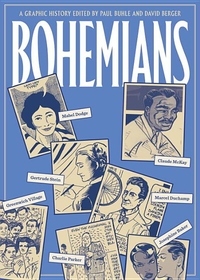 Bohemians is the graphic history of this movement and its illustrious figures, recovering the utopian ideas behind millennial communities, and covering the rise of Greenwich Village, the multiracial and radical jazz world, and West Coast and Midwest bohemians, among other scenes. Drawn by an all-star cast of comics artists, including rising figures like Sabrina Jones, Lance Tooks, and Summer McClinton, alongside established artists like Peter Kuper and Spain Rodriguez, Bohemians is a broad and entertaining account of the rebel impulse in American cultural history. featuring work by Spain Rodriguez, Sharon Rudahl, Peter Kuper, Sabrina Jones, David Lasky, Afua Richardson, Lance Tooks, Milton Knight, and others. The ebook edition is expanded from the paperback edition, and includes additional chapters on the swing music scene, La Boheme and midwest bohemians, as well as expanded material on the Greenwich Village intellectuals, Walt Whitman and Harlem jazz club Minton's Playhouse.